Genuine OEM Ricoh Toner Cartridge, Black, 30,000 page yield. 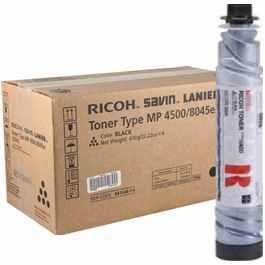 Ricoh part number: Ricoh 841346, 884922, 840040, 89828, 9828, 480-0397, MP 4500A. Laser Toner Cartridge compatible with Ricoh Aficio MP 3500, MP 4000, MP 4001, MP 4002, MP 4500, MP 5000, MP 5001, MP 5002.